On arrival at the airport, a warm greet by the Travelicious representatives who will later drive you to the hotel for the check-in process. Relax in your cozy rooms to get rid of the jet lag. In evening take a walk along the embellished local shops enriched with striking traditional crafts, Jewels and fashion apparels. After the dinner head towards your hotel for the peaceful nightlong sleep in the cozy rooms. Enjoy the mouth-watering morning breakfast and pursue the first attraction of your bucket list. Begin with some of the major attractions of the capital city such as Red Fort- ahistorical monolith built through red sandstone which nonce was the main residence of Mughal dynasty. Proceeding to Jama Masjid-holding the position of one of the largest mosque in India, this mosque has striking architecture accompanied three architectured entrances with an open courtyard to accommodate more than 25000 people at once, Raj Ghat, Rashtrapati Bhawan, Qutub Minar- India's tallest monument, India Gate, Lotus temple, Akshardham mandir etc. After the dinner head towards your hotel for the peaceful nightlong sleep in the cozy rooms. After the mood-refreshing morning breakfast continue your tour for the sightseeing of the next destination of your tour package. Agra-home to the majestic palace, Taj Mahal. Get check-in at the hotel once you reach your listed destination. Refresh yourself and without any further delay begin your tour of the next awaited attraction. Taj Mahal was built was Mughal Emperor Shah Jahan in the loving memory of his wife Mumtaz Mahal who was also called as the Jewel Of Palace. After the death of Mumtaz Mahal, Shah Jahan built this grandeur mausoleum which took almost 22 years and more than the intense labor of more than 10000 of workers. Every corner of the Palace will leave you spellbound by its striking architecture. That's why it holds the position of among one of the Seven Wonders of the World. Proceeding to Agra Fort & Mehtabh sunset point. After the dinner head towards your hotel for the peaceful nightlong sleep in the cozy rooms. After the mood-refreshing morning breakfast continue your tour for the sightseeing of the next destination of your tour package. Pause your tour at Fatehpur Sikri renowned monolith the giant Buland Darwaza. Get check-in at the hotel once you reach your listed destination. In evening take a walk along the embellished local shops enriched with striking traditional crafts, Jewels and fashion apparels. After the dinner head towards your hotel for the peaceful nightlong sleep in the cozy rooms. Enjoy the mouth-watering morning breakfast and pursue the first attraction of your bucket list. Cover the major attractions that include majestic palaces and historical sites. Continue your journey towards your next destination-Jaipur. 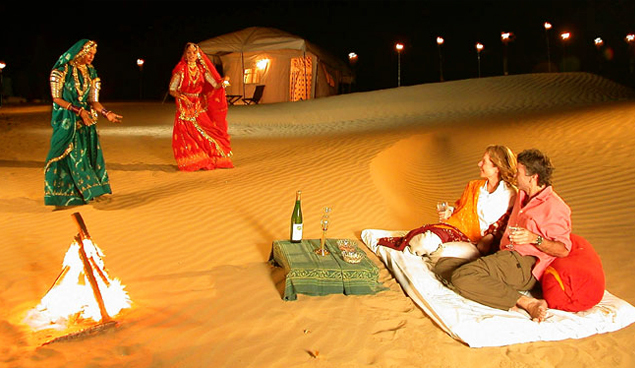 The capital city of Rajasthan, the city enriched with culture, traditions, and customs. Get check-in at the hotel once you reach your listed destination. After the dinner head towards your hotel for the peaceful nightlong sleep in the cozy rooms. Enjoy the mouth-watering morning breakfast and pursue the first attraction of your bucket list. City palace- where you can witness the royalty and grandeur of the royal kings and their families. VIsit Hawa mahal- Beautiful 5 story building made through red sandstones with striking intricate balconies build for the Rajputana women to watch the street play from there, Jantar Mantar, Amber fort-a grandiose palace spread over four levels each holding a courtyard. Situated at the height, you can try out an adventurous elephant ride to reach the top. After the dinner head towards your hotel for the peaceful nightlong sleep in the cozy rooms. After the mood-refreshing morning breakfast continue your tour for the sightseeing of the next destination of your tour package, Udaipur-Famed as Lake city of India. Get check-in at the hotel once you reach your listed destination. In evening enjoy the mesmerizing sunset view from sunset point splashing the breathtaking view of City Palace amidst the lake. After the dinner head towards your hotel for the peaceful nightlong sleep in the cozy rooms. Enjoy the mouth-watering morning breakfast and pursue the first attraction of your bucket list. Begin with City palace museum-rest atop the hill, the palace offers the splendid view of the Lake Pichola, Lake Palace, jag mandir. Visit Saheliyon ki Baari- splendid garden built by Rana Sangram Singh for the group of women who accompanied his daughter after the marriage as a part of the dowry. Bhartiya Lok Mandir and Pratap Memorial. In evening take a walk along the embellished local shops enriched with striking traditional crafts, Jewels, and fashion apparels. After the dinner head towards your hotel for the peaceful nightlong sleep in the cozy rooms. Enjoy the mouth-watering morning breakfast proceed for Delhi. Get check-in at the hotel once you reach your listed destination. In evening take a walk along the embellished local shops enriched with striking traditional crafts, Jewels and fashion apparels. After the dinner head towards your hotel for the peaceful nightlong sleep in the cozy rooms. Your tour concludes with the transfer to the airport after the morning breakfast to board the flight of your towards destinations along with tons of memories of the lifetime.